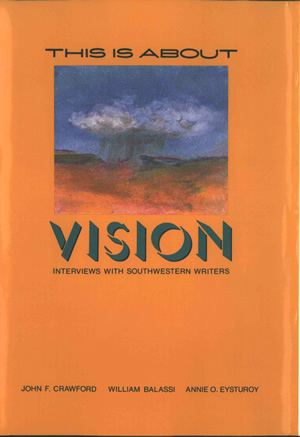 This anthology is titled This Is About Vision: Interviews with Southwestern Writers. Published by the University of New Mexico Press in 1990, and edited by John F. Crawford, William Balassi, and Annie O. Eysturoy, the book contains an interview with Tony Hillerman beginning on page 41. This is a first edition hardcover book with a dust jacket. Jacket illustration and design are by Cynthia Welch. The front cover has a peach background and features a watercolor illustration of a rain cloud over a desert landscape. The title is printed above and below the illustration, with the word "VISION" in turquoise. The editors' names are printed along the bottom. The back cover is also peach and printed in black is a list of titles by Southwestern writers from UNM Press. The bar code is at the bottom center of the back cover. The front flap displays the book title, editors' names, and a description of the contents. The back flap contains one-sentence biographies of the editors above the logo and art credit. The inside front and inside back covers are blank. Binding: Turquoise cloth-covered boards. The title, editors' names, and logo are printed on the spine in black.